I remember the first time it happened. I was dropping Nora off at her first daycare - an in-home center. Nora reached for the woman who ran the daycare and said; “mama!”. I could tell the woman felt uncomfortable. I didn’t. When your child is small, they sometimes liken the word “mama” to love. "Mama" can come to be shorthand for the individual who cares for them, provides comfort and dries their tears. When Nora uttered those syllables, I felt comforted. I felt it was a clear sign that during those long hours while I worked, she was feeling loved by this wonderful woman. Fast forward to a few more daycares, another child, and so many more “mamas”. As the season of back to school is upon us, I can’t help but reflect on what these teachers mamas have meant to our family. To the woman who walked the halls. I remember getting to daycare for what felt like the one millionth time to pick him up sick. You weren’t “his teacher” anymore. He had already transitioned to the next room. But, there you were all the same. Cradling him and walking the halls. So calm. So loving. I’m sure you were tired. I know I was. But, you pushed through that tired so gracefully and found an extra gear. Thank you for finding that gear for my boy. Thank you for loving my boy like he was your own. And, for ignoring my silent, tired tears as I took him from your arms. To the woman who exuded pride. 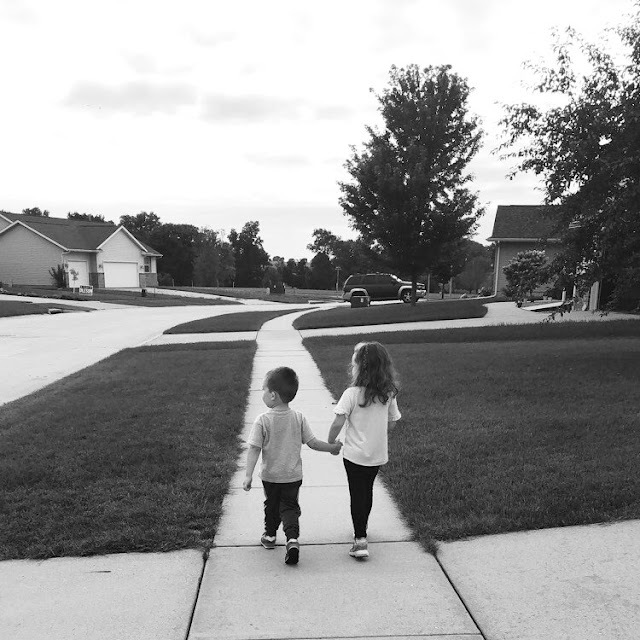 Sometimes it feels like our littles are the only littles who have ever learned to walk or count or sing the ABCs. It’s always nice when someone genuinely shares your pride in your littles’ accomplishments. Thank you for the countless texts and pictures of our little writer working tirelessly on her letters. Thank you for spending your own time and money to put together lines and curves for her to practice at home. Thank you for sharing my pride as she beamed with pride at all you accomplished and learned together. To the man who changed her card to yellow. I hate to label a four year old, but honestly, sometimes you have to call a spade a spade. So, I'll say it. I believe my daughter to be Type A. To her, a green behavior card - the color that symbolizes a good day - is not enough. Every day must be a pink card day. Pink symbolizes exceptional, and that's certainly what she's striving for each day. But, sometimes, just sometimes, we all have yellow card days, don't we? And you were brave enough to call a spade a spade too. You switched her card to yellow knowing it wouldn't be easy on her. And, you took the time to talk her through it. And me too. We all learned that day that life isn't easy and we can't be great all the time. Except for you. You were great. Thank you for taking the time. Thank you for being brave with us. To the woman who loved them no matter what. For over two years you cared for at least one of them. You laughed when they said funny things and shed tears when they were sick. You embraced them for the people they are - the crazy and the sassy. You saw the little person in the midst of all the big emotions no matter what. You made room in your arms for extra cuddles and became an extension of our family. Thank you. Thank you for making your lap a second home. Thank you for loving them for who they are - the good and the not-so-good. That's what mamas do!